The love-able little droid from Star Wars The Force Awakens, now available as a remote control toy. BB-8 is the cute and loveable little droid from the latest Star Wars (The Force Awakens) movie. In case you haven’t seen the movie yet, BB-8 is a spherical, loyal Astromech Droid belonging to the Resistance pilot Poe Dameron and follows along the adventure for most of the movie. The RC version mimics BB-8’s movements in the movie (i.e. : can roll in any direction) and he was also designed to mimic its expressive sounds. This remote control is easy to build and loads of fun to play with! 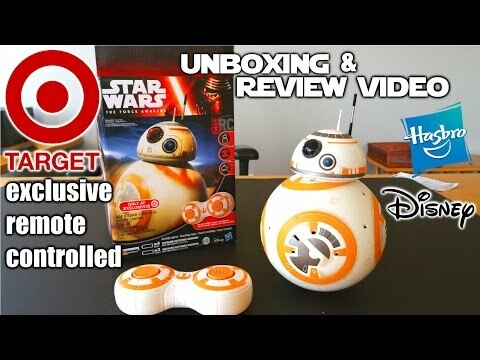 Target's EXCLUSIVE STAR WARS rc BB-8 DROID unbox, build & review – THE FORCE AWAKENS!!! Looking For a Different Remote Control? Check out our other great RC gift ideas!